This is the main part of the constellation Cygnus, including Deneb and Sadr as main stars, covering a field of about 20 by 20 degrees. 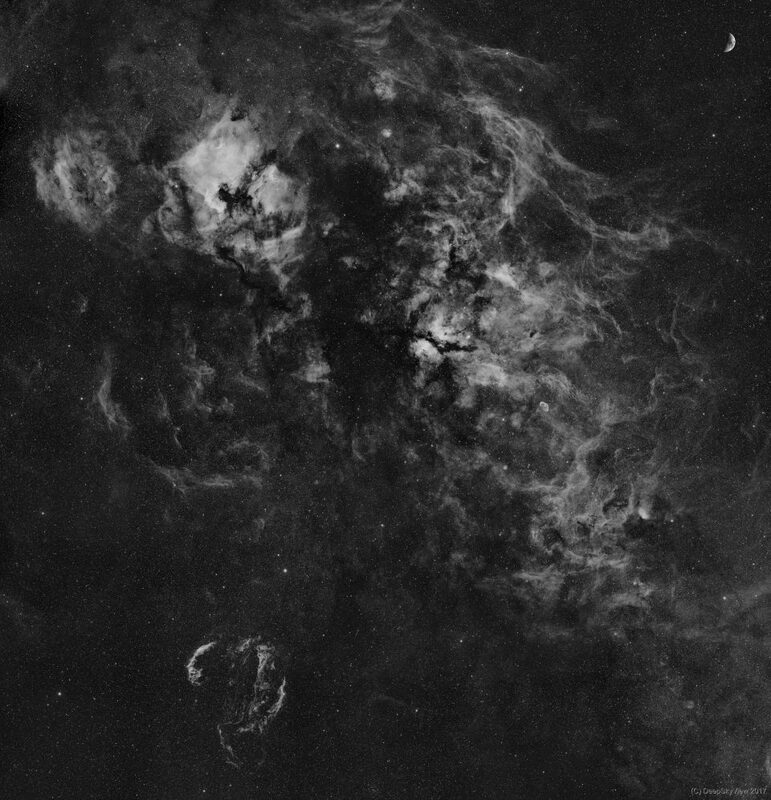 This image focusses on the rich H-alpha nebulosity in this region. In contains some of the famous emission nebulae, e.g. the North America Nebula, the Pelican Nebula, the Crescent Nebula, and the Veil Complex. However, what I find even more exciting is the sheer mass of nebulosity that covers the whole field with dramatic ripples and dark lanes. This is a 5 x 7 mosaic (35 panels) obtained with the Samyang 135mm lens and the ATIK 460ex camera using the 3.5nm Baader H-alpha filter. For a better sense of scale of the whole structure, I copied an image of the moon taken with the same setup into the upper right corner. Make sure to zoom in as far as you can to really see the amazing detail in this image. Processing was rather easy, thanks to MosaicByCoordinates and the GradientMergeMosaic tools of PixInsight. The file at full resolution – more than 100 mega-pixels – is getting a bit large, so this a 50% resampled version. In addition there is an annotated version below, indicating all the Sharpless, NGC, and IC objects in this region.